Dr. Moore was riding horses competitively when he started having leg pain and weakness from an accident. He visited local chiropractor Dr. James Swetlic feeling skeptical since he didn’t have any back pain. I’ll never forget that first adjustment. It was incredible, as if my back became unlocked. I had no more pain or weakness. I decided right then that chiropractic was something I wanted to do. He’d considered entering the medical field but wasn’t sure which profession he was interested in. With such a successful experience, Dr. Moore knew that chiropractic made more sense than any other form of health care. 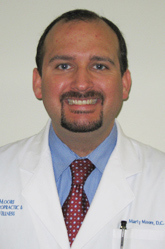 Dr. Moore first attended the University of Toledo and Ohio State University where he studied chemistry, biology, physics, physiology and anatomy. He was then accepted at Palmer College of Chiropractic in Davenport, Iowa. There, he took more science-based courses in addition to X-ray, diagnosis and chiropractic adjusting techniques. Dr. Moore also began seeing patients at the college’s clinic. Since that time, Dr. Moore has achieved a certification in Myofascial Release, giving him the expertise needed to treat your entire body. A Chiropractic Skeptic? We Understand! The greatest gift we receive from our patients is when they feel comfortable enough to refer their family and friends to our practice. They may have children who bounce back quickly from a health challenge, or an older parent who has tried other avenues without success. Dr. Moore enjoys helping the people in our community move better and feel incredible. Dr. Moore lives in Medina with his lovely wife Lacie, their two sons Croix and Alexei, two dogs and two cats. Their family spends most of their spare time together, including attending their children’s sporting events. All of them receive regular chiropractic care, and their boys have been adjusted since hours after birth. We are in-network with most major insurances, including Medicare and nearly all Medicaid plans. Contact us today to get started by booking your appointment!